For children with cancer, already suffering from social isolation and often undergoing debilitating medical treatment, summer camp and its recreational activities are often off-limits. However, a new camp is launching this summer at the Jewish Community Center of Staten Island for children with cancer and their siblings, and youngsters from New Jersey are welcome; pick-up sites have been set up in Newark and New Brunswick. Both the camp and transportation are free. The program is part of the Sunrise Day Camp network, which also operates on Long Island and in Baltimore and Pearl River, NY, and at three locations in Israel: Ramat Yohanan, Even Yehudah, and Be’er Sheva. Though the camps are housed in Jewish institutions, campers don’t have to be Jewish. Children do not have to be undergoing treatment at these hospitals to be picked up from them. Moreover, Gallanter said, arrangements can be made for children who are not able to get to one of the hospitals. “We won’t deny any child the opportunity to come to camp,” she said. Because it costs about $6,000 per child, the Staten Island JCC has committed to raising $500,000 annually to fund the camp and will hold a walkathon on Sunday, June 5, at Mount Loretto Campus of Catholic Charities on Staten Island. Gallanter is the former director of special needs at what is now the Jewish Federation of Greater MetroWest NJ and a longtime member of Temple B’nai Shalom in East Brunswick. Irene Yablonsky Shprints of Old Bridge has been driving her 13-year-old son, Eric, from her southern Middlesex County home, first to Sunrise on Long Island for a year and then to Pearl River, since 2012. Now in remission after treatment for non-Hodgkin lymphoma at Memorial Sloan Kettering Cancer Center, he will continue to attend the Pearl River camp, where he has many friends, said his mother. Shprints, who is a computer programmer in Paramus, uses the Hackensack pick-up site for Eric. 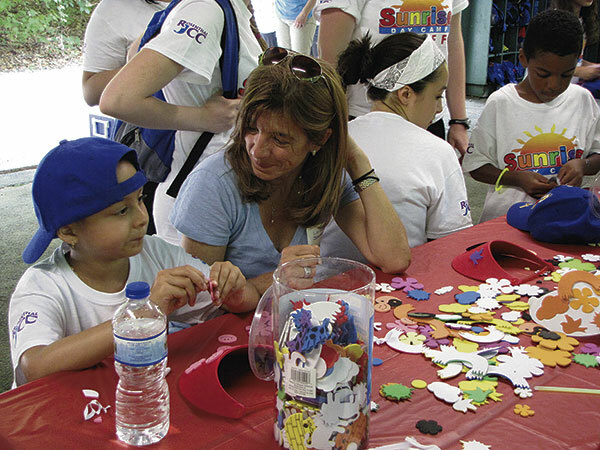 Gallanter, who was working at the Friedberg JCC in Wyandanch on Long Island when the program began there, said Sunrise camps have the usual activities, including arts and crafts, sports, shows, and special events, but many are tailored to meet the special needs of the campers. For example, a softball or volleyball may be softer than a usual one because children undergoing treatment may bruise more easily. The Staten Island JCC camp, which will run July 11-Aug. 18 this first year, allows children to attend as many or as few days or weeks as they would like. It is open to youngsters three-and-a-half to 16 years old who were diagnosed with cancer up to five years prior. “Some of our children may be in remission, but they may be delayed socially because of the cancer, so we provide a support system for these children and their families, including siblings, who are also affected,” said Gallanter. Because of the strong bonds formed by camp families, weekend and holiday activities continue throughout the year, she said. Both the campers and other sick children are also visited year-round at affiliated hospitals through Sunrise on Wheels. 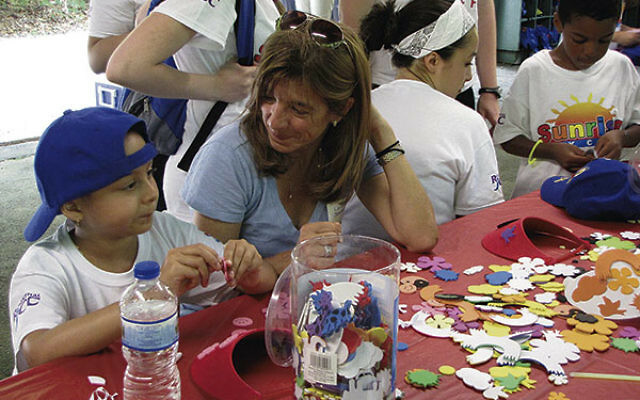 Julie Wagner, a pediatric hematology-oncology social worker at the Valerie Fund Children’s Center at Beth Israel, has had children she is working with attend the Pearl River camp and will have others going to the Staten Island facility. Sunrise, she said, is “incredibly well organized,” starting the minute the children get on the bus. “They have counselors on the buses and they’re singing camp songs,” said Wagner. “They just love it. “This is the first day camp we’ve ever worked with that is unique and beneficial to our populations because it allows them to go home to their families,” said Wagner, pointing out that the sleep-away camp model for ailing children doesn’t work for everyone. Additionally, because radiation and chemotherapy leave some children immuno-comprised, many can’t attend school, camp, or participate in normal childhood activities because they can’t be in crowded spaces, she explained. For information on Sunrise Camp at the JCC of Staten Island or to register for the June 5 walkathon, go to sunrise-walks.org/SI or contact 718-475-5261 or sunrise-daycamp-statenisland.org.